UNO Metabolic cages for mouse, rat or guinea pig. The UNO Metabolic cages are equipped with a unique system for the separated collection of faeces and urine. Design and finish are such that the animal has a maximum of comfort. Maintenance is efficient and fast. The stainless steel metabolic cages can be de-contaminated from isotope-testing. This is not possible with plastic metabolic cages. Every unit comes complete with cage, adjustable feed passage, feed bowl, faeces and urine collection system and drinking bottle holder. All parts can be easily disassembled and the collection system is of the slide-out type. The adjustable feed passage ensures a minimum of feed waste. The feed bowl can be used for pellet feed and, after fitting a special plate, for powdered feed. 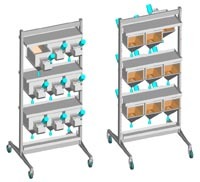 The seperate unit can be placed in a table support (see above) or in a movable rack. 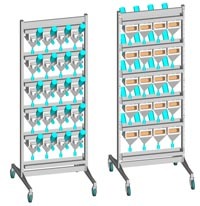 These racks are intended to accommodate a minimal of 12 and a maximum of 20 UNO Metabolic cages depending on the type of animal. 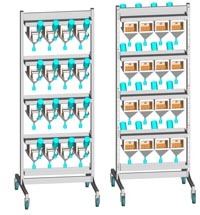 The racks are mobile through 4 castors, 2 of which with brakes. The rack is made of Stainless Steel. Each cage is provided with a removable labelholder. Metabolic cages for medium and large lab animals, rabbit, dog and pig are also available on request.